Kennels, also known as crates, can make a great place for your dog to feel comfortable and secure in. 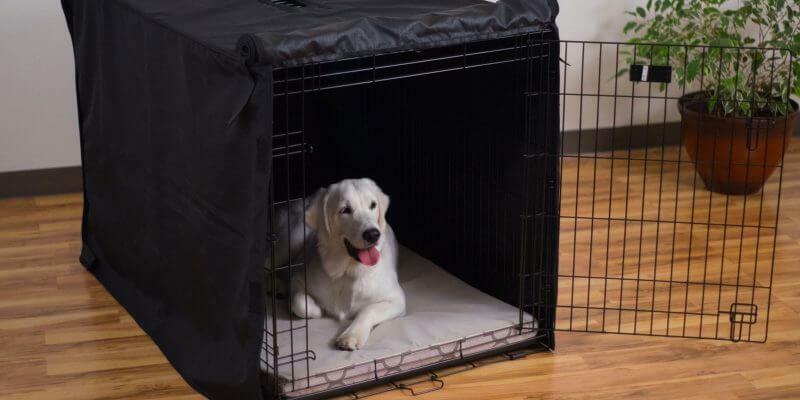 You may also choose to use a dog kennel cover for your dog’s crate to make it even cozier and more den-like. To some dogs, a covered crate can help them to feel calmer and less anxious; it’s soothing and offers some privacy to the dog. 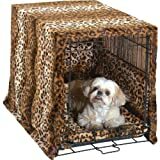 So, let’s find out how kennel covers can be useful, then we’ll take a look at the top 5 best kennel covers on the marketplace today. Maybe you’re thinking, “Hey, I’ll just throw a blanket over it.” But let me tell you something: a properly fitted dog crate cover is much safer and easier to use than just hanging a towel or blanket over it. This is because, if your dog is still a puppy or an avid chewer, he could easily pull these into the crate, chew on them and potentially swallow pieces of fabric. 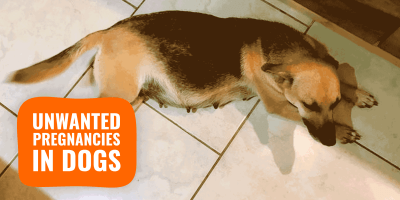 This could result in an intestinal blockage and an emergency trip to the vet practice. What’s more, towels and blankets can have a smothering effect, cutting off air circulation inside your dog’s crate. Most quality kennel covers are made with breathable fabrics and contain windows to allow better ventilation. Remember, the cover needs to fit snugly over the crate. So, once you’ve got the right size crate for him or him, make sure you get the correct-size cover to match! Some dogs feel safer and more comfortable with a covered crate. If your dog gets anxious or barks on seeing his or her surroundings, you may find that with a cover he or she will find it easier to settle down. The same goes when using a travel crate or carrier for dogs, and pets in general. Covering it will make the pet that is inside more relaxed. If you live in a cool climate or your dog’s kennel is sometimes placed outside, a cover can protect him, keeping him warm despite the elements. A kennel cover offers a better insulation and can break winds too. It’s a good solution when paired with a dog house heater or heating pads. Covers for outdoor kennels will also protect your dog from too much sunlight, too many insects, and any rain. Obviously, kennel covers aren’t meant to resist extreme conditions but they will do just fine in most cases. Let’s be honest – dog crates can be unsightly things. So, why not get a nice cover to give it some style? There are many varieties, from simple black or gray to colorful patterns and designs to suit your home. 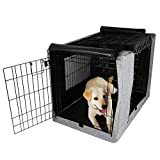 Don’t fall into the trap of customizing your dog’s crate using a cover that looks the part but is offering little to no protection. Think practical, first! So, now we’ve seen how crate covers can come in handy and how to introduce them to your dog, here are our suggestions of the top 5 best kennel covers on the market right now. 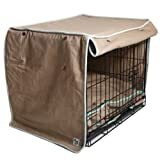 This dog kennel cover from MidWest comes in 6 sizes (22″L, 24″L, 30″L, 36″L, 42″L, 48″L) to accommodate most sizes, for toy – extra large breed dogs. Made from durable, machine-washable polyester, you have a choice of either black or camouflage. It has a versatile design, with hook and loop attachments on each side flap to hold them together. This means it will fit firmly over the crate and also allow you easy access to front, rear and side doors. You can use this design to adjust your dog’s visibility and ventilation, as you can simply lift the side and hook it in place. It also allows access to the slide-out pan so it can be removed easily for cleaning. Some puppy owners and owners of more dedicated chewers have said that their dog was able to pull this cover into the crate and sink their teeth into it. So, this may not be the best choice for more curious pooches. Hook and loop attachments don’t necessarily stop some dogs from pulling the cover down, but this is an extremely rare occurrence and could theoretically happen with any cover. This Precision Pet cover comes in 6 sizes (19″L, 24″L, 30″L, 36″L, 42″L, 48″L), so it can be used for toy breeds up to extra large breed dogs. As for colors, it comes in navy or tan. This cover features a back zipper, which holds the cover in place and allows easy setup and removal. It can only be used on 1 door crates, as there is only one front door panel. 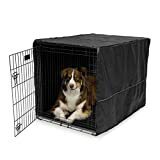 This cover is a heavy-duty item that can be for indoor as well as outdoor use, so it’s perfect for traveling or if you like to have your dog crated outside at times. The fabric is obviously water-resistant and features reinforced double stitching and heavy duty zippers. It provides your dog protection from the wind, rain, sunlight, bugs, and other outdoor elements. There are mesh side windows with shades that can be rolled up and held in place with Velcro to adjust visibility and ventilation. There is also a panel that can be rolled up on the top. This crate cover from Petsfit is available in 3 sizes (30″L, 36″L, 42″L), so it’s suitable for medium and large breed dogs. You can choose from 2 designs: single (black) and double door (gray), both of which are made from soft but durable oxford cloth. It comes with mesh side windows (there’s just one on the double door design), and panels can be rolled up on the sides, top, and front to increase visibility and ventilation. There is a zipper feature on the back so it can be easily slipped over and secured to your dog’s crate. This cover is windproof and waterproof, so it is a good choice if you go traveling with your dog or you like to have her crate outdoors at times. Many customers have reported that the double-door cover does not line up exactly with the side door, impeding the ability to open the door fully. If style is what you’re after, this is probably the one for you. There is a large variety of patterns to choose from that can match your taste and your home decor. Molly Mutt crate covers come in 5 sizes (24″L, 30″L, 36″L, 42″L, 48″L) for small and also giant breeds. The door and side panel can be rolled up and simply snapped in place for easy access or more visibility/ventilation. If you want to keep the panels closed, there are straps with snaps on the bottom corners to attach them together. For the pooches who get up to no good, however, this cover could well end up being pulled down or into the crate, as these snaps could come apart with force. A few customers have reported that the fabric is very durable and long-lasting however it is not machine-washable but can be washed in cold water and air dried. This Pet Dreams Complete set comes in only two sizes (30″L, 36″L), making it suitable only for medium to medium/large dogs. You can choose from a leopard print pattern or a less eye-catching coco brown color. 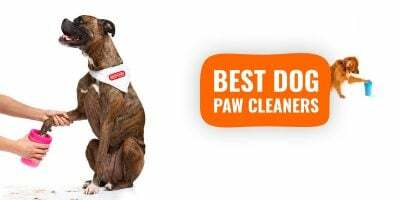 Pet Dreams promise that each part of the set is machine-washable and dryer friendly, so there is no hassle when it comes to cleaning it. The safety bumper attaches to the back and sides of the crate with velcro and provides the ultimate comfort, as well as more safety, and (of course) a bit of fashionable style! This set can convert your dog’s unattractive wire crate into his or her own little comfortable bedroom. This crate cover does not include roll-up panels or windows for accessibility or to adjust visibility and ventilation. However, it does not feature a front door panel, so your dog will always be able to see and get airflow through this. There are no attachments with this cover, it just hangs on the crate much like a tablecloth, so it could be pulled down by pesky pups or the more avid chewers. You must introduce your dog’s kennel cover slowly. If you place it fully over the kennel straight away, there is a chance your dog will become stressed or anxious in that sudden dark spot. To begin with, just cover the top. Then, after a couple of days, you can cover one side, then a couple of days later, the other. 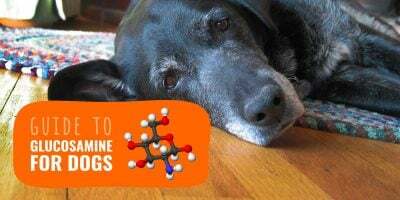 If, after a few of weeks of having the crate covered, your dog whines or shows signs of not wanting to enter, she is probably telling you she doesn’t like it, and you should remove it. In rare cases, some dogs prefer to be inside without anything placed atop. Covers can make a crate more like a den, which some dogs love. If you think your dog would like a covered space, it’s worth trying it out, but make sure you get the right one for you and your dog. The Precision Pet model is fitted with a back zipper, so it’s a little sturdier. It’s a heavier duty model, making it more suitable to pups and chewers. It’s also great for those who go traveling with their dogs or have them crated outside, as it’s water resistant. It is for use only on 1 door crates, but it has side mesh windows plus a roll-up panel on the door, which gives you the option of more visibility. About The Author — Alexandra Seagal has been an animal lover for as long as she can remember. She dedicates her life to loving animals, but more importantly, to caring for and training them properly. 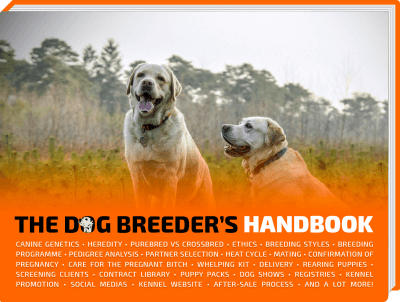 She believes that there is a lot of knowledge to acquire when it comes to properly taking care of an animal. It was for this reason that Alexandra started her blog over at Animalso.com. Her goal is to spread her knowledge and answer questions on important topics, from what to feed your dog to how to train her.